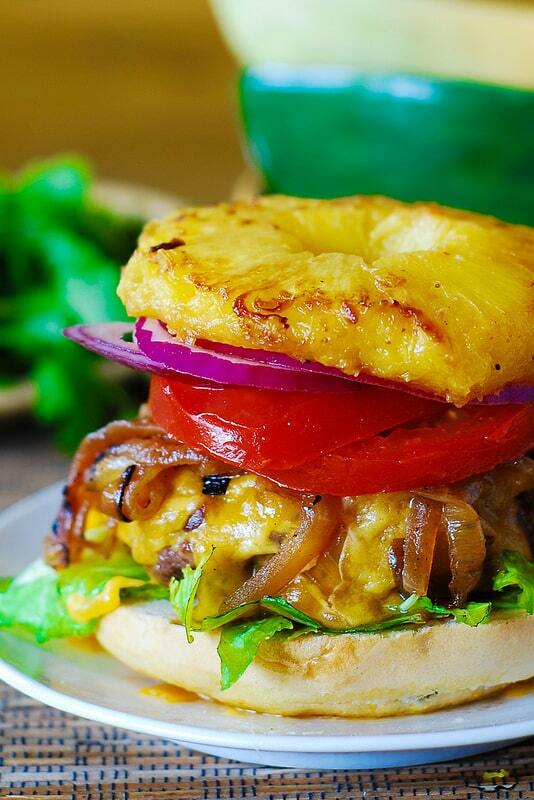 Grilled Hamburger with Caramelized Onions and Grilled Pineapple – easy and delicious way to serve grilled hamburgers. I’ve had a hamburger with a grilled pineapple for the first time in Hawaii, and ever since I began to appreciate the addition of something sweet to the grilled beef. 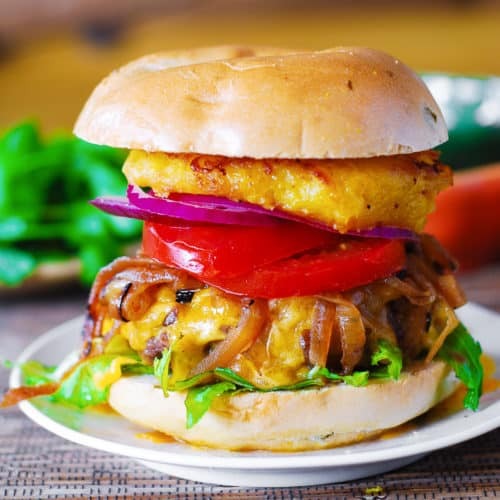 Because the pineapple is somewhat acidic, even a little bit tart, but yet sweet – it combines perfectly with a hamburger meat, cutting through the fat and creating a balance of flavors! I like to serve these hamburgers open-faced – that way you can really see the grilled pineapple on top, and I don’t like too much bread with meat anyway. But, it’s up to you – use a whole bun or only half of it! 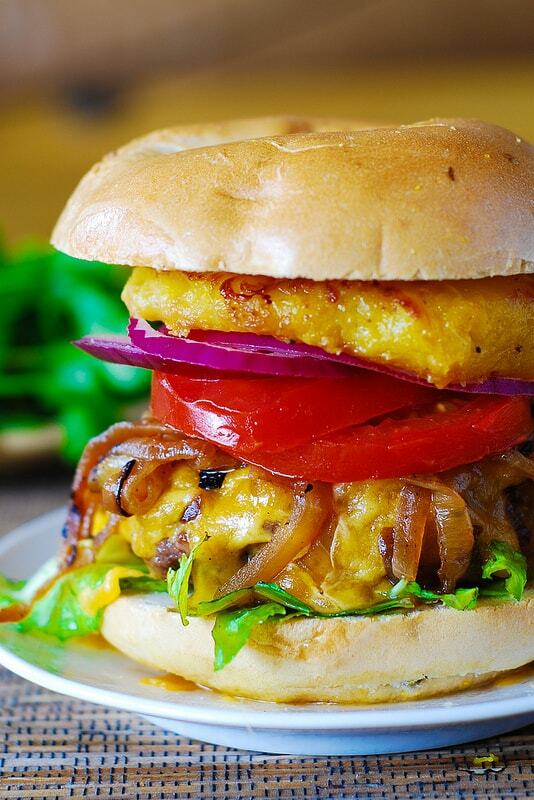 Juicy grilled hamburger with caramelized onions, grilled pineapple, topped with melted cheddar cheese, tomato slices and red onion. First, we need to caramelize the onions, prior to grilling the burgers and the pineapple. Heat 1 tablespoon olive oil on high heat in a large skillet, when oil is heated, add sliced onions and cook on high heat for about 10 minutes, constantly stirring with spatula. The onions should start to brown, but without burning (a couple of onions may be burnt here and there, but overall they should not be charred). Continue cooking for 10 more minutes on medium or low heat, stirring occasionally to make sure onions don’t stick to the bottom of the pan or burn. Total you should have cooked onions for 30 minutes. Remove from heat and sprinkle onions with a small amount of balsamic vinegar to deglaze the pan. Using spatula, mix the onions, scraping the bottom of the pan and coating onions with a pinch of balsamic vinegar you just added. Make 4 equal hamburger patties out of ground beef. Season both sides of each patty with salt and pepper. Because the ground beef has been refrigerated before you formed the patties, allow the burgers rest at room temperature, for about 20 minutes, while the grill heats up. Heat a gas grill to high heat, about 450 degrees Fahrenheit. Brush both sides of each hamburger patty with vegetable oil (otherwise, they will stick to the grill). Grill hamburger patties for about 3 minutes on the first side. Flip them over, and cook the other side of each hamburger patty for 4 minutes for medium-rare burgers or 6 minutes for well-done burgers. In the last minute of cooking, arrange a slice or two of cheddar cheese on top of each hamburger patty to melt. In a microwave, melt honey just a little bit, add 1 tablespoon of olive oil and combine – in a medium bowl. Add pineapple slices (or rings) to the bowl and stir to coat the pineapple slices. At the same time you’re grilling hamburgers, place pineapple on the grill and cook for about 3 or 4 minutes on each side. Remove from the grill and keep warm. Arrange lettuce on the bottom of each bun. Place grilled hamburger patties (covered with melted cheddar cheese) on top of lettuce. 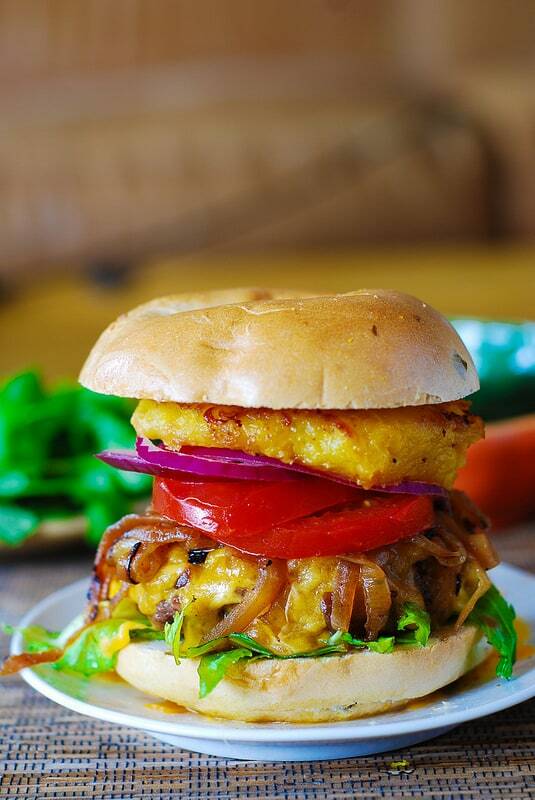 Top each burger with caramelized onions, then tomato slices, and red onion slices. Finally, add grilled pineapple slice(s). Close with the top bun, if desired, or serve these as open-faced hamburgers. Hi Julia, love this. Would you like to share this with the other participants in Food on Friday over at Carole’s Chatter? I have a weekly link up party – each week there is a different ingredient or theme. The current theme is BBQ!